Here's a list of Skills for all 4 Stars Thunder Element Heroes in Bloodline: The Last Royal Vampire mobile game. If you want to know the new skill set of your 4* heroes after evolving them from 3*, or if you are looking for a nice Thunder Hero to add to your team, then you may refer here for information. - Heart Barrier II: All party members recover a small amount of HP and gain 30% reduction in damage received for 1 round. - South Eagle II: Thanks to the Wall of Protection, Eagle receives 10% less damage; in addition, REC rate is improved by 10% when he is in the same party as Pep. - Fortify II: All party members receive 15% less damage. - Aegis Chant II: Play the Chord of Protection to give the entire party a double shield: damage received is reduced by 25% for 3 rounds. - Fervor Chord II: Gary starts playing his beloved banjo, increasing CRI hit rate of all Squad mates by 8%. - Wrath Score II: All party members gain 10 Fury after every attack. - Thunder Power II: Ivy appears before the enemy, dealing moderate Thunder damage to all enemies. - Thor Rage II: Thunder Power has a small chance to Paralyze the enemy for 1 round. - Thunder Guard III: Thunder enemies deal 25% less damage. - Thrust II: Perform a leaping strike with a spear, dealing minor Thunder Element damage to all enemies. - Weapon Art II: Sean polishes his shield, causing DEF to be raised by 20% for 3 rounds at the beginning of the round. 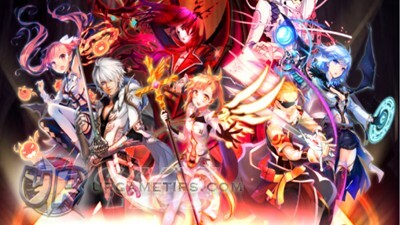 - Holy Support II: Damage from the ULT Skill of all party members increases by 60%. - Thunderclap II: 1 round of severe Thunder Element damage to a single enemy, with a small chance to cause paralyzed. - Thunder Storm II: Yuwi accumulates the power Shock bolts, with a 10% chance that the next attack will cause 200% damage with every attack. - Stun Guard II: All party members gain high resistance to paralyzed while receiving 10% less damage. - Ult Skill: An Active Skill that is available when Hero's Fury bar is full. Can be upgraded through Fusion using Skill Mats, or Heroes with Similar Skill Type (Single. AoE, or Healing). - Talent: A Passive Skill that appears after reaching the required Number of Stars (mostly 3 Stars) and unlocks depending on the required Lvl of the Hero. - Leader Skill: A Passive Skill that activates once a Hero is selected as Leader or Ally. The effect still works even if the Leader or Ally has been defeated.